For the 24 hours to 23:00 GMT, the EUR declined 0.27% against the USD and closed at 1.1744, following dismal economic data in the Euro-zone. Data showed that the Euro-zone’s ZEW economic sentiment index unexpectedly plunged to a level of 12.6 in June, compared to a level of 2.4 in the previous month. Separately, in Germany, the ZEW economic sentiment index dropped more than expected to a level of -16.1 in June, recording its lowest reading since September 2012, weighed down by trade war fears and Italy’s political crisis. In the prior month, the index had registered a fall to a level of -8.2, while market participants had expected for a decline to a level of -14.0. Moreover, the nation’s ZEW current situation index eased to a level of 80.6 in June, more than market consensus for a fall to a level of 85.0. The index had registered a level of 87.4 in the previous month. The US dollar rose against a basket of currencies, ahead of the US Federal Reserve’s policy decision and following positive US inflation data. In economic news, the US consumer price index (CPI) climbed 2.8% on a yearly basis in May, notching its highest level since February 2012 and compared to a rise of 2.5% in the previous month. Further, the nation posted a budget deficit of $146.8 billion in May, after recording a surplus of $214.3 billion in the prior month, while markets were anticipating the nation to record a deficit of $144.0 billion. The NFIB small business optimism index rose more-than-anticipated to a level of 107.8 in May, reaching its highest level in 34 years and compared to a level of 104.8 in the prior month. Markets were anticipating the index to rise to a level of 105.0. In the Asian session, at GMT0300, the pair is trading at 1.1746, with the EUR trading 0.02% higher against the USD from yesterday’s close. 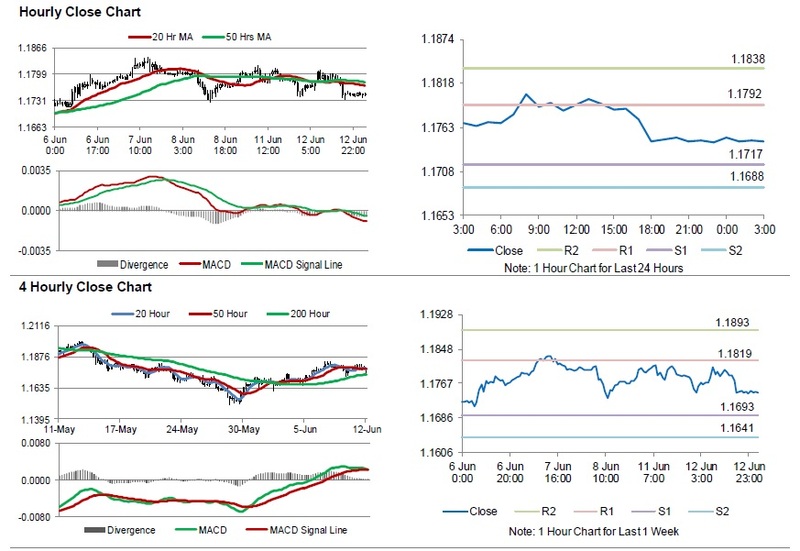 The pair is expected to find support at 1.1717, and a fall through could take it to the next support level of 1.1688. The pair is expected to find its first resistance at 1.1792, and a rise through could take it to the next resistance level of 1.1838. Looking ahead, traders would keep a close watch on the Euro-zone’s industrial production data for April, slated to release in a few hours. Later in the day, traders would focus on the US Federal Reserve (Fed) monetary policy decision, where the central bank is widely expected to raise interest rates. Moreover, the release of US producer price index for May, will keep investors on their toes.